Is a popular champion racing at Saratoga? You may be better off betting the long odds. Horse racing is no stranger to upsets, but Saratoga has a peculiar reputation as the "Graveyard of Champions". Four historic upsets have contributed to Saratoga's reputation as the course where champions go to lose. Even as recently as 2015, Triple Crown winner American Pharoah raced at Saratoga and lost. But does Saratoga truly deserve its reputation, or did the best horse win? Man o' War, one of the greatest racehorses of all time, won 20 out of 21 races in his career. The one race he lost was at Saratoga. A colt fittingly named Upset beat Man o' War In the 1919 Sanford Memorial Stakes at the Saratoga Race Course. Man o' War was never a Triple Crown winner because his owner decided not to enter him in the Derby, but the astounding thoroughbred won the 1920 Preakness and Belmont Stakes, even setting a world record. Man o' War retired to stud in 1921 and - fun fact - was the grandsire of Seabiscuit. Ever wondered why we have the Jim Dandy Stakes at Saratoga? Well, the race is named for the horse that upset Gallant Fox in 1930 and earned Saratoga its nickname as the "Graveyard of Champions". The second Triple Crown winner in history, Gallant Fox was expected to easily take the Travers Stakes in 1930. Jim Dandy, a 100-1 outsider, defeated Gallant Fox and rival Whichone by three lengths. The muddy track was blamed for Gallant Fox's poor performance, and Gallant Fox went on to win the Lawrence Realization Stakes at Belmont in September. Just a few weeks after winning the 1973 Triple Crown, Secretariat lost the Whitney Stakes to a little-known horse named Onion at the Saratoga Race Course. To call this a stunning defeat would be to put it mildly, but perhaps the crowd of adoring fans should not have been so surprised: just under two weeks before the Whitney Stakes, Onion had set a new track record for 6.5 furlongs at Saratoga. After American Pharoah won the Triple Crown in 2015, rumors flew about whether or not the three-year-old would race at Saratoga. 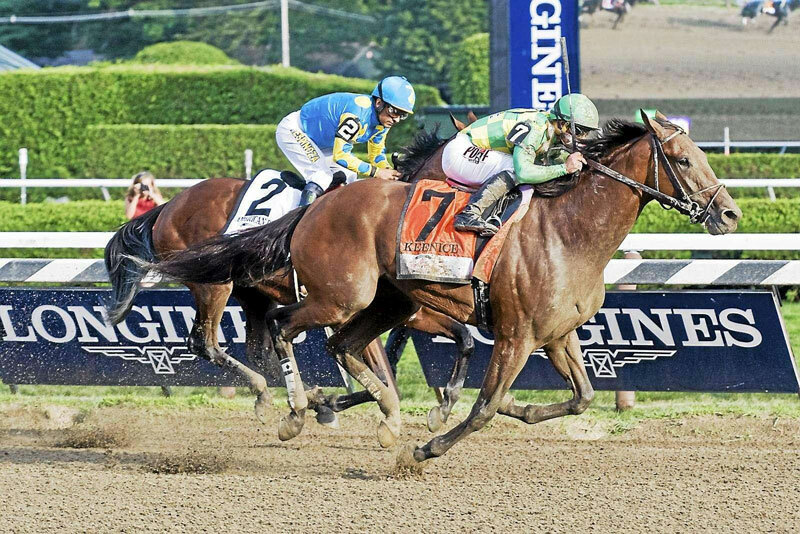 At the Travers Stakes on August 29, 2015, American Pharoah did race in front of a record crowd, finishing a close second to Keen Ice and cementing Saratoga's reputation as the "Graveyard of Champions".